Kale is a hot food these days. I mean super H-O-T. 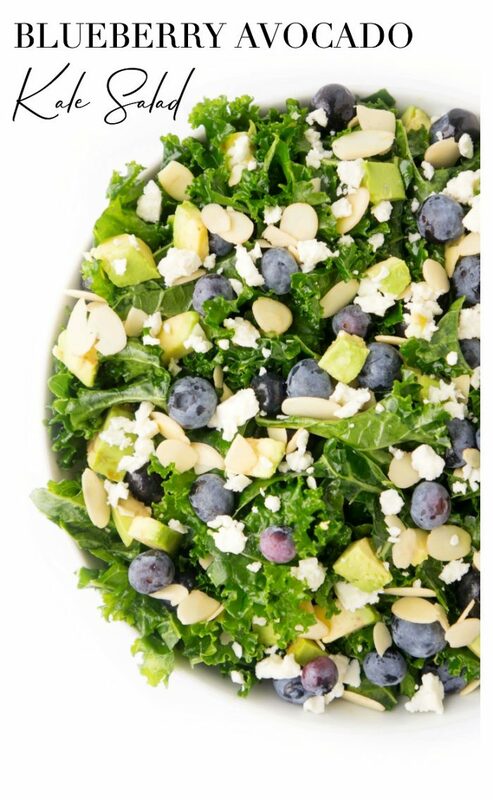 I didn’t realize quite how popular kale was until the other day when I decided to serve this kale salad for an event. The second that I said the word “kale,” people swarmed around the salad like wasps. I practically had to fight them off with my salad tongs. It was THAAT bad. But it wasn’t just the kale that made it amazing. It was the whole combination of ingredients. Blueberries for a pop of sweetness. Avocado for that nice creamy texture. Sliced almond for a little crunch. Feta for a touch of saltiness. And a flavourful lemon vinaigrette for a bit of zest. 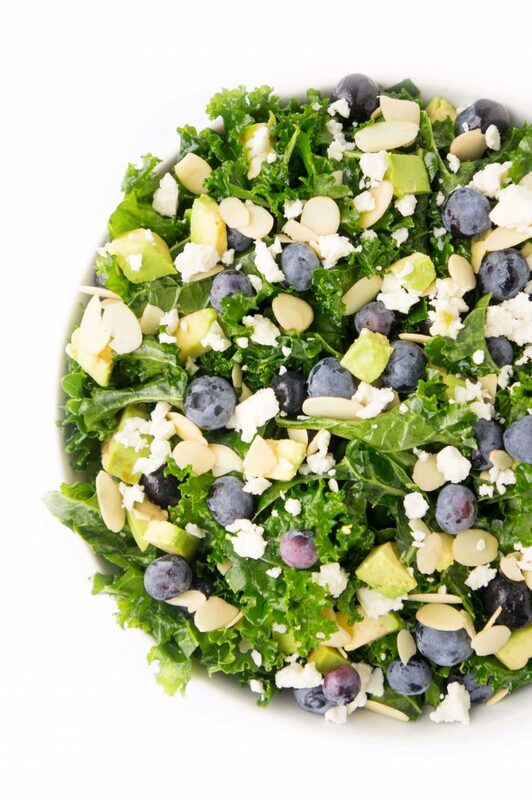 When combined all together, it makes for one delicious Blueberry & Avocado Kale Salad. For those of you who have tried kale before, you know that your jaw is going to get a pretty darn good work out when you chew it, especially when consuming it raw. But the trick with kale salad is to massage the leaves with the dressing to help soften up the leaves and remove some of the bitterness. I would massage it for at least a few minutes. And of course, unlike most salads, you can actually let the dressing sit on the kale for a while before or after consuming without worrying about it going all soggy on you. It actually tends to taste BETTER the longer the dressing has a chance to absorb into the leaves. Now as more of a complete meal, you could also incorporate some grilled chicken into this salad. The amazing thing about adding protein to a salad like this is that it makes for a nice hearty and filling meal. But, of course, if you’re looking for a lighter salad to serve more as a side, you can always leave it out. Personally, I like it both ways! 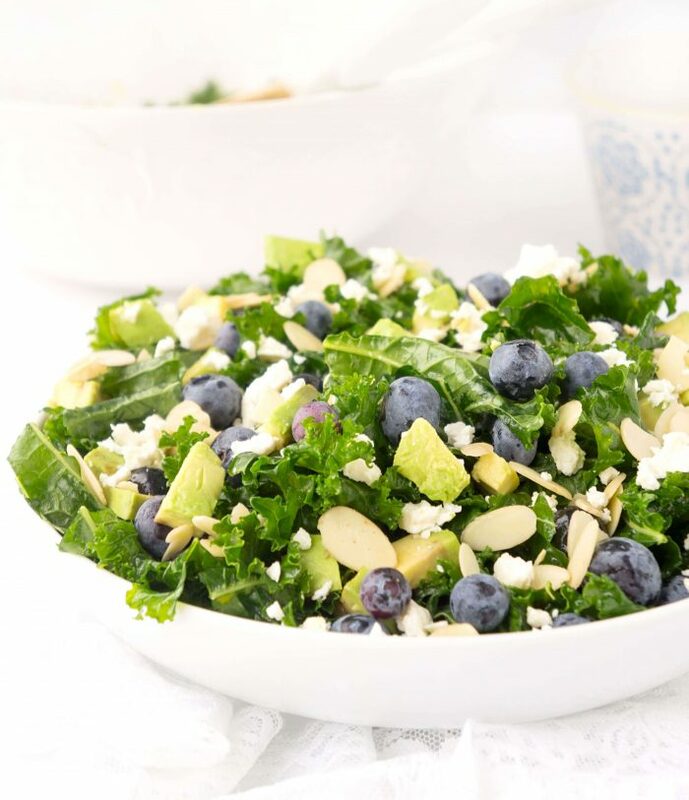 Next, add some juicy blueberries for a pop of flavour and antioxidants, and avocado and sliced almonds for some heart healthy fats, and you’ll be just one big ball of healthy energy. Then top it off with some feta cheese for a kick of protein and calcium. And the lemon vinaigrette….ohhh that tasty vinaigrette is really what makes this salad pop with zesty freshness. I even like to make some extra dressing and save it for other salads throughout the week. For the record, for years, I used to eat at least two salads per day. Sometimes I got in trouble from my mom when I was a kid because I apparently ate too much spinach and we were going through it too fast. Anyways, my point is that I’m always on the hunt for leftover homemade salad dressing for those times when I overdose on salad. 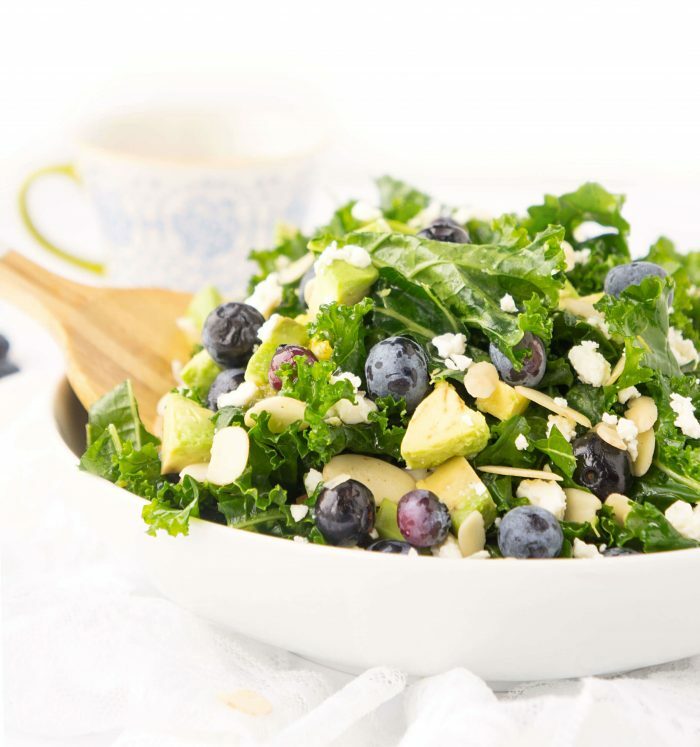 And I have a feeling, that after trying this Blueberry & Avocado Kale salad, you’ll be doing some serious salad overdosing too! To make the vinaigrette, whisk together the olive oil, apple cider vinegar, lemon juice, lemon zest, maple syrup, salt and pepper in a small bowl and set aside. 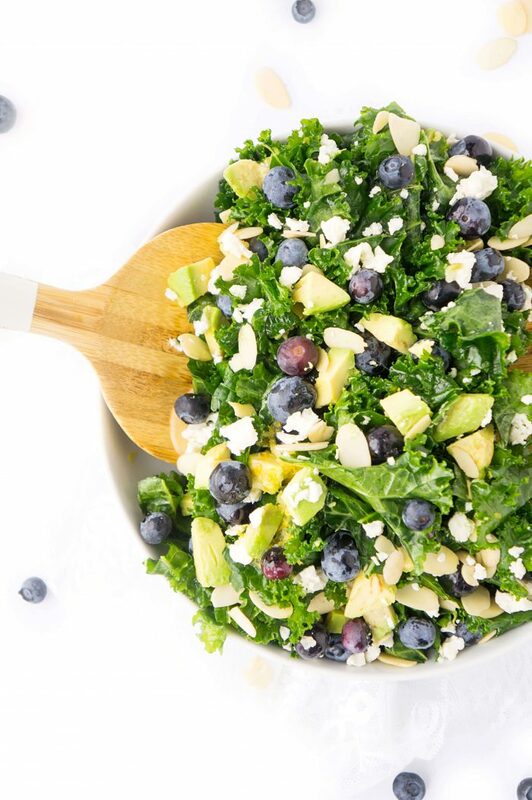 To prepare the salad, place kale in a large bowl. 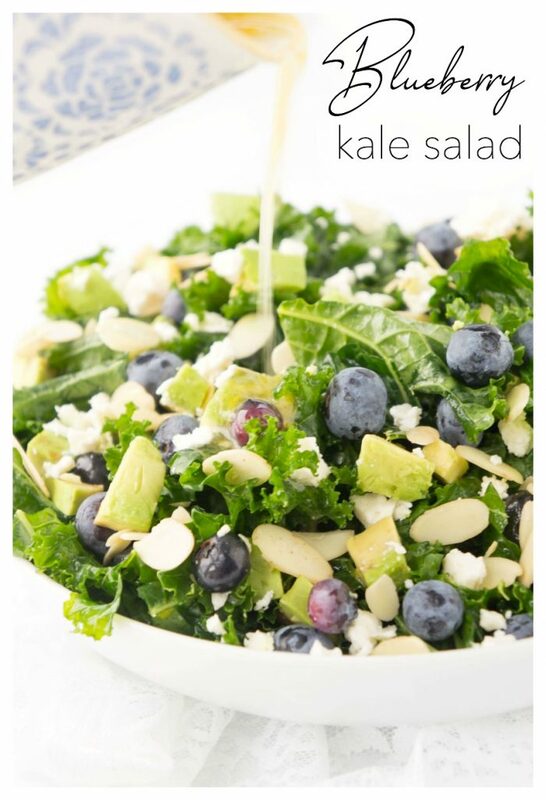 Pour desired amount of dressing over the kale and massage into leaves for several minutes. 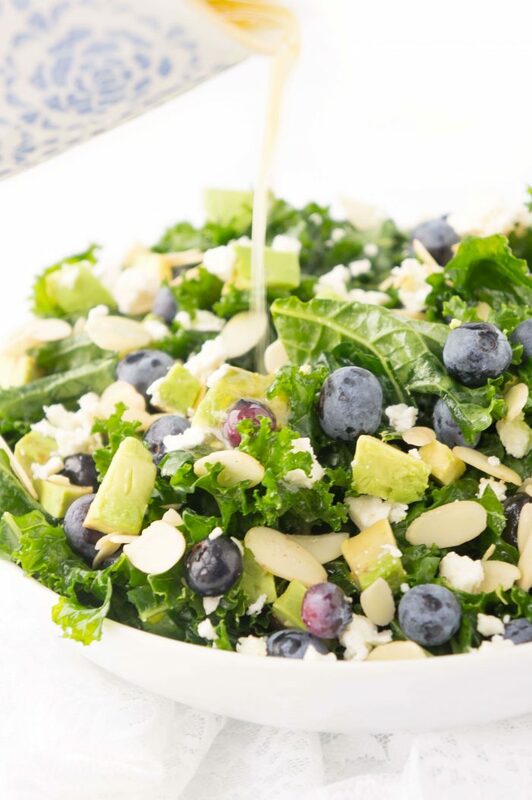 Toss kale with avocado, blueberries, almonds and feta cheese. Serve immediately or allow to sit in the fridge for several hours. Store the remaining dressing in a container in the fridge for later use (I only used half the dressing). 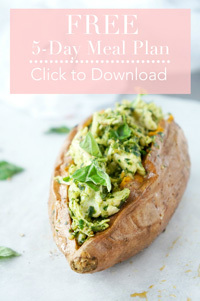 Looking for other delicious salad recipes? Check these out! Ok, this salad is AMAZING Elysia!! So colourful and light with the blueberries, greens and zest of the lemon vinaigrette. It’s a refreshing addition to celebrate any occasion. I made it this weekend to celebrate Mother’s Day with my family. This is perfect for any spring or summer get-together. I just LOVE it! This really made our Mother’s Day feast a big hit! My Mom is already asking me for the recipe of the lemon dressing to make for herself at home. ;) Keep these recipes coming! Thanks so much for the feedback Alana! I’m so happy that you and your family enjoyed the salad! I’ve got a lot more recipes in the works, so stay tuned ;) Hope you had a wonderful day with your family!